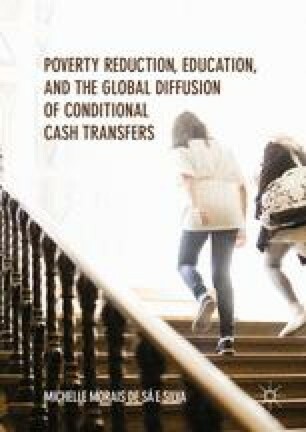 Paves the way for the study of specific conditional cash transfer (CCT) cases, where the interest lies mainly in analyzing how CCTs and education policy have interrelated. The chapter briefly introduces the theories and concepts that framed the study of cases. It also explains the methodology used in the comparative study, so as to establish the credibility of its results. Hess, F., & Henig, J. (2008). ‘Scientific research’ and policymaking: A tool, not a crutch. Education Week. Retrieved February 12, 2008, from http://www.edweek.org/login.html?source=http%3A%2F%2Fwww.edweek.org%2Fsearch.html%3Fqs%3DHenig&destination=http%3A%2F%2Fwww.edweek.org%2Few%2Farticles%2F2008%2F02%2F06%2F22hess.h27.html%3Fqs%3DHenig&levelId=2100&baddebt=false. National Commission on Excellence in Education. (1983). A nation at risk. Retrieved November 5, 2008, from http://www.ed.gov/pubs/NatAtRisk/index.html. Pons, X., & van Zanten, A. (2007). Knowledge circulation, regulation and governance. Literature review (part 6). Louvain: EU Research Project, Knowledge and Policy in Education and Health Sectors. Retrieved from http://www.knowandpol.eu.